Hawthorne North provides your family with close access to Valparaiso schools. Hawthorne North has generous lot sizes in a beautiful setting. Click here to view more lots for sale. Hawthorne North is located 3.5 miles from award winning downtown Valparaiso. Over 50 Local Retailers along side many big box shopping centers. State RD 49 to Burlington Beach, in Valparaiso, west onto Burlington Beach to Calumet Ave, turn north main entrance on right/east side of Calumet Ave.
Hawthorne North is a residential subdivision located in Valparaiso, Indiana. 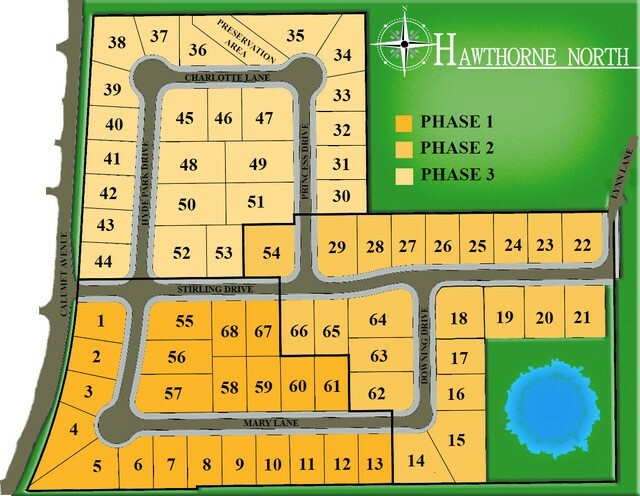 Hawthorne North offers Valparaiso, Indiana 68 spacious lots that are conveniently located just 3.5 miles from its award-winning downtown. All home sites are served by city utilities and are located within the Valparaiso school system. Covenants & Restriction have been established to ensure quality and consistency throughout the entire development. Come see why we believe that Hawthorne North is the most exciting new development on Valparaiso’s north side. Directions: State RD 49 to Burlington beach in Valparaiso Indiana, west onto Burlington Beach to Calumet Ave, turn north main entrance on right/east side of Calumet Ave.